Preheat the oven to 200°C/400°F/Gas 6 and line a baking sheet with baking paper. Fold a sheet of baking paper in half so that it has a crease running down the middle and then open it out again. Put 210ml/7½fl oz/generous ¾ cup water and the butter in a medium saucepan over a low heat and bring to a simmer, stirring to make sure that the butter has melted completely before the water reaches the boil. While the water is heating up, sift the flour and salt together onto the baking paper and repeat twice. 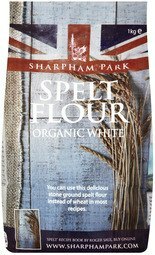 This is to aerate the flour. Once the water is boiling, use the baking paper to make a funnel and shoot the flour and salt into the boiling water and butter mixture. Immediately turn off the heat and stir the mixture vigorously for about 20 seconds until it is thick and comes away from the side of the pan. Spread the dough on a plate and leave to cool for 10 minutes to room temperature, then put the dough back in the saucepan but keep it off the heat. Gradually add the beaten eggs and make sure that you really beat the mixture each time to fully incorporate the egg. Do this until the mixture reaches a smooth, dropping consistency. Use two teaspoons to put little balls of choux dough on the prepared baking sheets, leaving a space between each one. Bake on the top shelf of the oven for 15-20 minutes until puffed up and golden. It is important not to open the oven door for the first10 minutes, as this can lead to the collapse of the choux buns. Remove the buns from the oven, insert a skewer underneath each bun and hollow out any uncooked choux mixture before placing them back in the oven for 5-10 minutes to completely dry out. Transfer to a wire rack to cool, then fill and glaze, as you like. Put 150g/5½oz of the chocolate, the double cream and salt in a heatproof bowl set over a saucepan of gently simmering water and leave to melt without stirring. Remove from the heat. Beat the ganache, using an electric whisk, for a few minutes until it is light and fluffy. 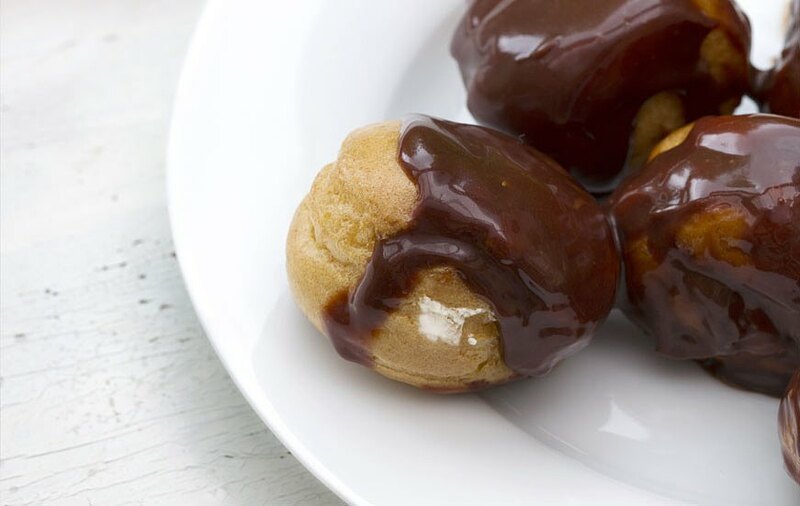 Spoon it into a piping bag with a large, plain nozzle and pipe it into the choux buns. Meanwhile, grate about 1 tablespoon of the remaining chocolate and melt the remainder in a small heatproof bowl over a saucepan of hot water. Dip the top of each bun into the melted chocolate and sprinkle with the grated chocolate.